East Lancashire LDWA - Daffodils and Snowstorms? Sunday April 1st. Coope's Dozen. 20 miles from Rivington. Leader: Gordon Stone. What a glorious day for climbing some hills! It was my first time leading a walk and a new route to boot. 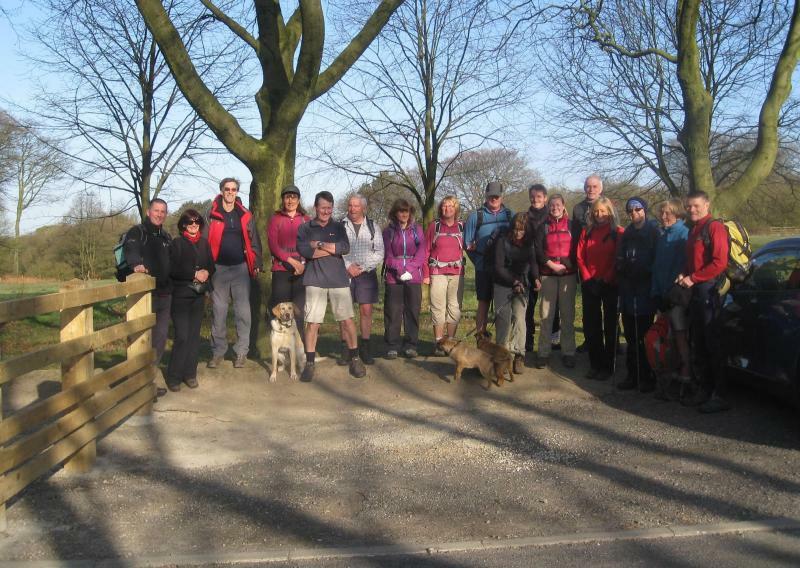 Seventeen bipeds and a couple of quadrupeds (canine variety) started out from Rivington (our incumbent former trainee guide dog puppy was there just for the photoshoot and the first half mile). Some of us had to scrape the ice from windscreens at home for this crisp but sunny morning but by nine o'clock the day looked very promising. After a mile, the flattish walking was over and we had our first big climb from Ammunition Corner to our first summit, Noon Hill. 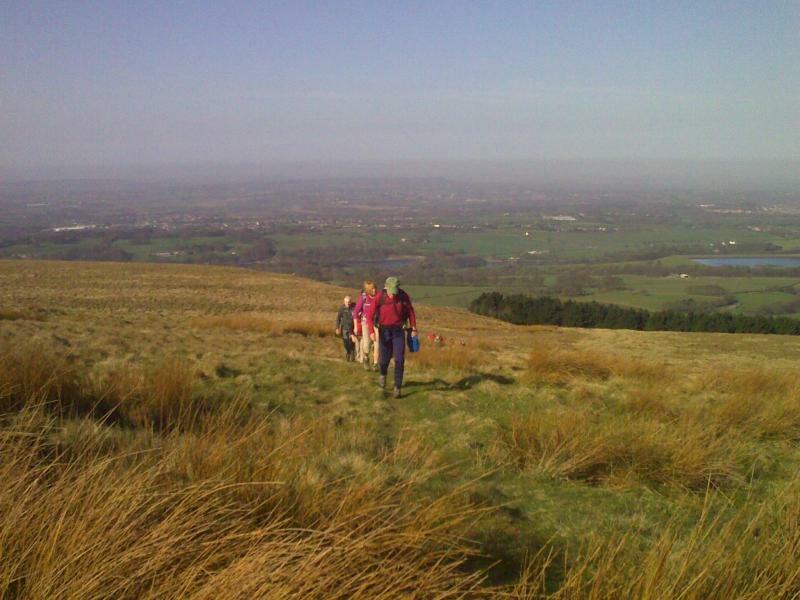 Rivington Pike and Two Lads were soon knocked before elevenses then an easy walk via The Trespass Stone to Whimberry Hill and Egg Hillock, new hills to many of the group. A sharp descent to Shady Dingle then the work began with a hard climb up to Counting Hill. Regrouping we were soon at our lunchtime stop just beyond Winter Hill and the end of the mast road, nicely out of the cooling wind. The afternoon half of the dozen started with a steep descent on the way to Horden Stoops before climbing up the well-trodden path in the direction of Great Hill. 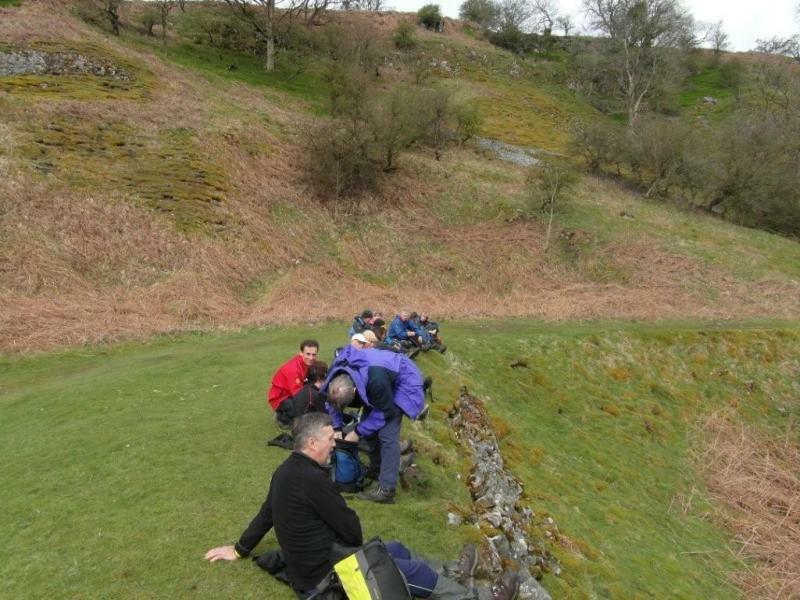 Before reaching Spittler's we veered to the right for a decidedly untrodden path to find the remote, rarely visited summit of Old Adam's Hill - I suspect we could be the most number of people to populate its summit at one time. The route back from Old Adam is just as challenging as getting there but once at Spittler's the remainder of the day was just enjoyable, taking in Great Hill and the reputed medieval burial mound of Round Loaf to stop for afternoon refreshments at White Coppice where a number availed themselves to ice-cream from the now open café. The only downside came on the climb to Healey Nab which has been spoiled by Thursday's idiots setting it on fire although we did sight a Zeppelin above us! Four miles and we were all safely back at Rivington having taken eight and a half hours for the 20 miles with about 4000ft of climbing. Everybody said they enjoyed it - I suspect the weather played a big part as some parts would be quite challenging in wet or icy weather. We certainly had magnificent views from all twelve summits. Thank you to all for turning up and being so supportive and to my good friend, John Coope, who devised the original route as a challenge run many years ago. Wednesday April 4th. The Wizard. 15 miles from Wilmslow. Leader: Steve Blackshaw. A blazing sun, blue skies and a warm breeze were enjoyed by members of the East Lancs LDWA as they set out from Wilmslow to walk through some of the gentler parts of Cheshire. The route, planned by Steve ‘Fast Blackshaw’ and his sis, the equally ‘Fast Pike’, took in the outskirts of Mobberley, Nether Alderley, Alderley Edge (home to many famously well-paid footballers) and Mottram St Andrew. Sunglasses were essential, as was a good supply of water. 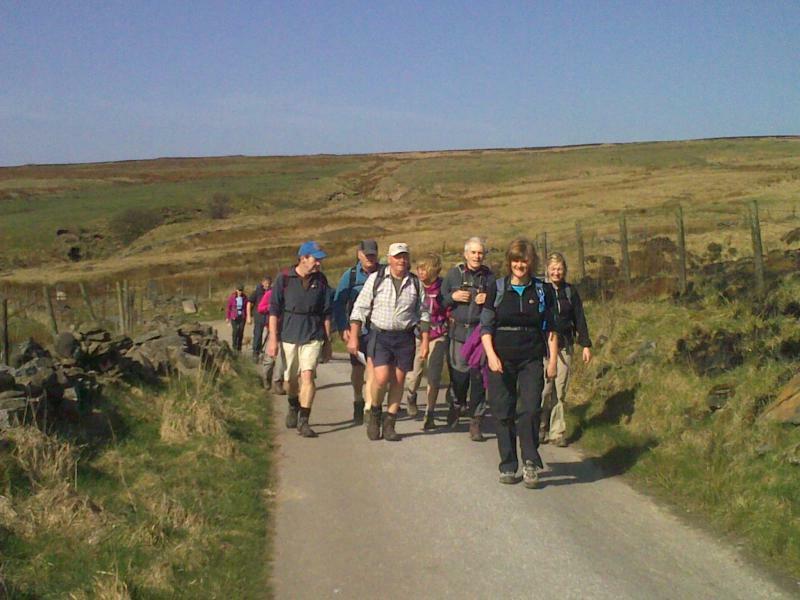 Plastered in suncream, the explorers began their recce of the 16 mile route which was due to be followed some days later by the elite walkers of the East Lancashire LDWA ‘A’ Team. 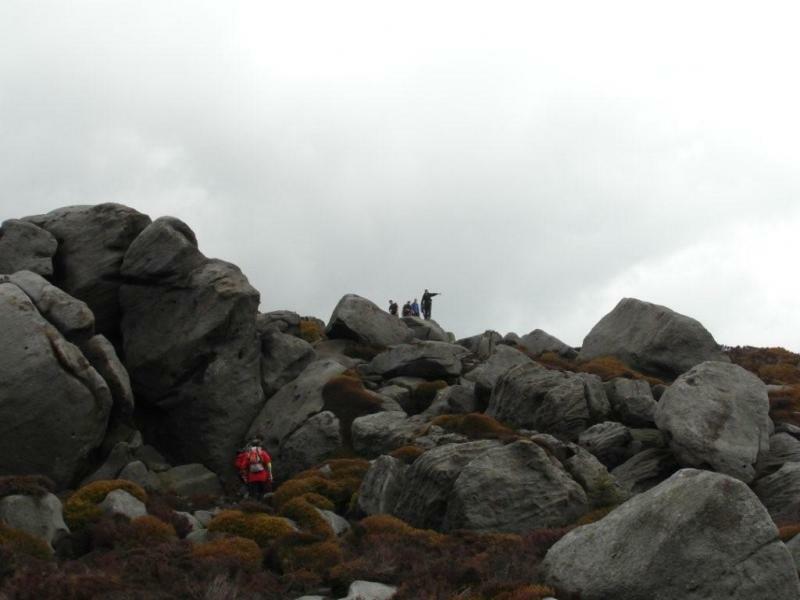 The group laid bets that on the day of the ‘proper’ walk, it would snow. On the appointed day it was predictably cold, windy and sleeting. 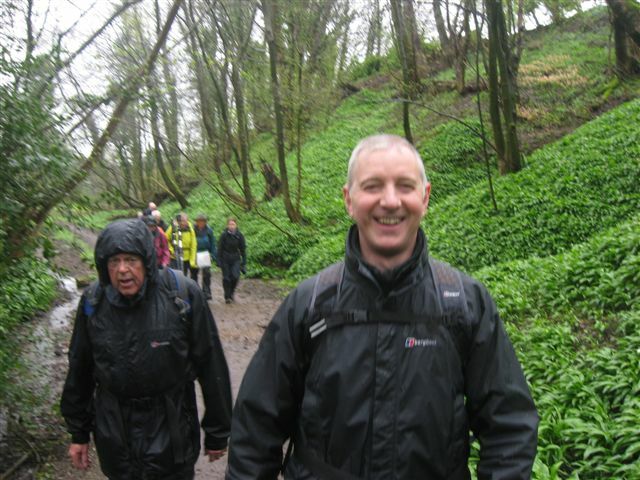 The walk leaders decided whilst en-route to the meeting point that as the weather was so bad, and assuming nobody would be daft enough to venture south of the border, we would adjourn to the pub – and stuff the walk. However we were shocked to find that walkers had travelled from near and far to meet in the Lindow Car Park on the western edge of Wilmslow. Messages from those who weren’t so daft were received by phone and text….you know who you are…..and now we know you’re not daft! It was a grand total of twelve walkers that set out that morning, heading into the rain-sodden Cheshire countryside, not knowing what adventures lay ahead. The route passed by many places of interest including Lindow Moss, (Llyn Ddu = Black Lake) the spot where the body of Lindow Man (known locally as Pete Bog) was discovered in August 1984. Towards Mobberley we were entertained by all manner of not very native wild-life including llamas and alpacas. An Eagle Owl, caged in a large aviary, was very interested in us – perhaps it thought we would feed it….or perhaps it would feed on us! 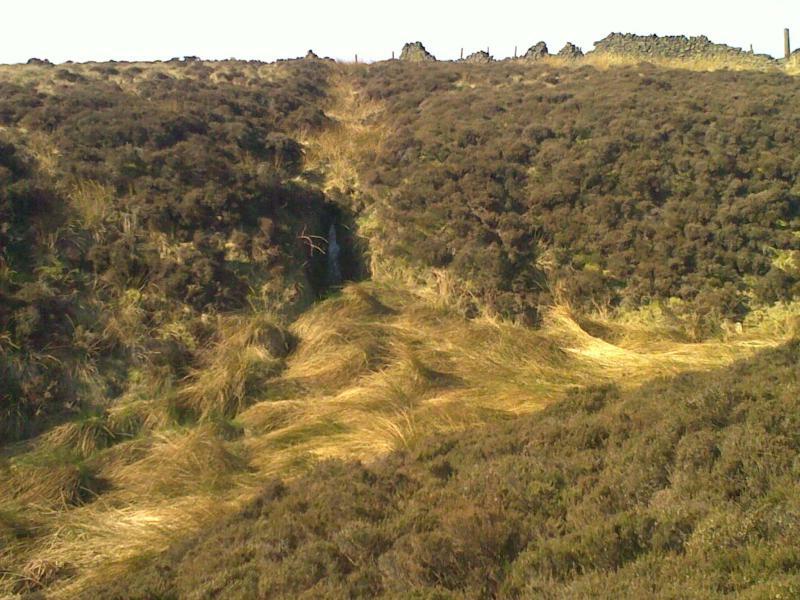 Our route continued, crossing many stiles, the condition of some leaving a lot to be desired. The excessive use of barbed wire was potentially quite dangerous. A field of cows with their young calves was a little worrying, it was difficult to decide whether they were being frisky or just aggressive in their protection of the little ‘uns. Carefully detouring around the small herd we succeeded in causing as little disturbance as possible. A welcome rest stop in the church yard of St Mary’s in Nether Alderley proved an interesting one, with a mausoleum, an Elizabethan school and many very old grave stones. Unfortunately the church was locked but that didn’t stop some of our group sheltering in the church porch whilst they enjoyed their butties. A short section of main road took us past Nether Alderley Mill, but it was hidden by screens as the National Trust were carrying out renovations to the ancient building. The gentle ascent to Alderley Edge was through pleasant woodland. 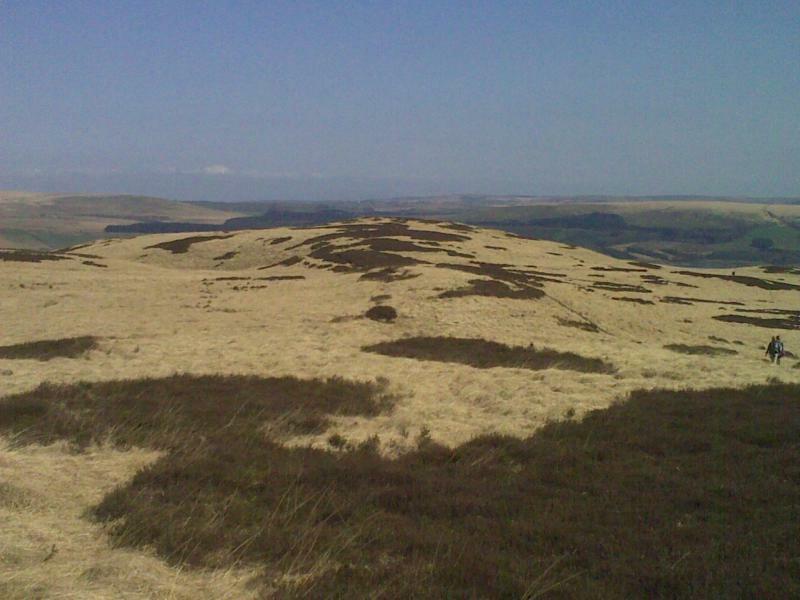 Once at the Edge itself it was possible to see the snow-covered hills of the western edge of the Peak District. Those with good eye-sight (or binoculars) were able to see the Vulcan bomber on the runway at Woodford Aerodrome in the middle distance. The steep descent off the edge had some walkers slipping and sliding, but it wasn’t long before we were back on the flatlands. 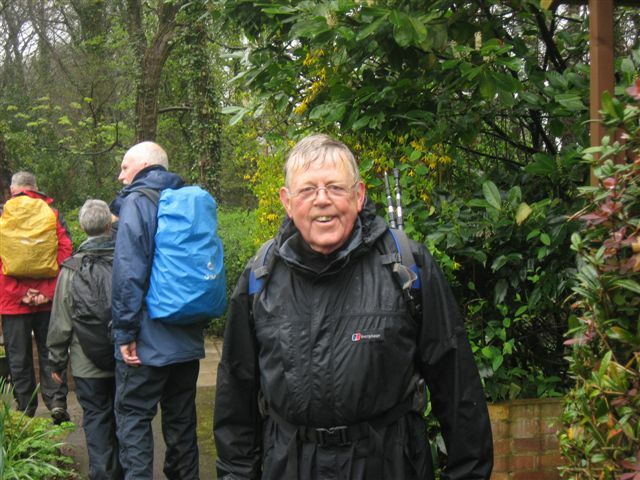 Joining the north bank of the River Bollin, our leader marched us in a westerly direction, back into Wilmslow. Our route now coincided with the Bollin Valley Way and was really very pretty. Entering the edge of the town, and once again in busy civilisation, it was something of a relief to enter the local parkland known as The Carrs. Still following the River Bollin, we were soon back at our cars. The Boddington Arms, adjacent to Lindow Car Park provided both welcome refreshment but also shockingly bad news: InBev, who own Boddingtons, have announced that they are stopping production of Boddingtons Cask Bitter. I’m flabbergasted. Apart from this terrible news, it was a good (if cold and soggy) day out in excellent company. 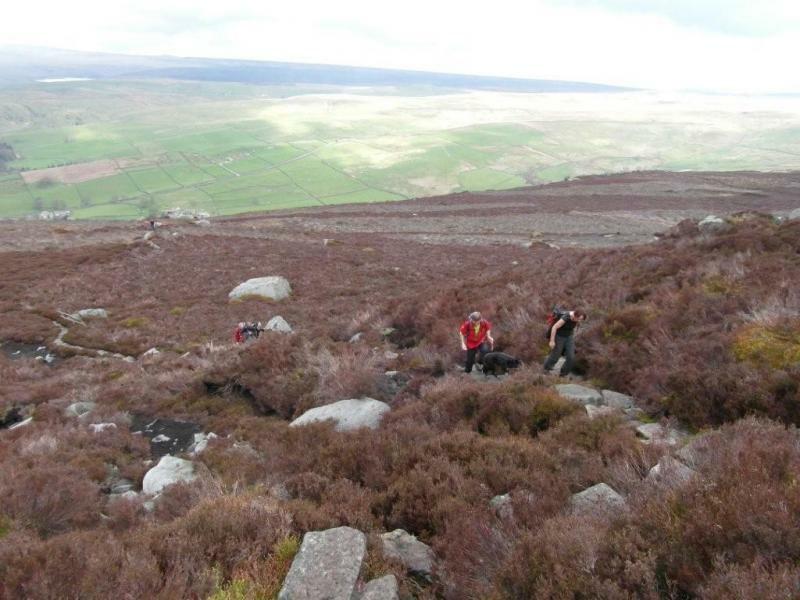 Bogs were crossed, lakes passed by, even a hill was climbed (specially included for Norman). Thanks to Fast Blackshaw and equally Fast Pike for planning it! Please see link below for photos from John. Who said, “It’s very rare it rains all day in this country”? Because I could swing for them whoever it was!!! Well it might have rained all day but it didn’t dampen our spirits. 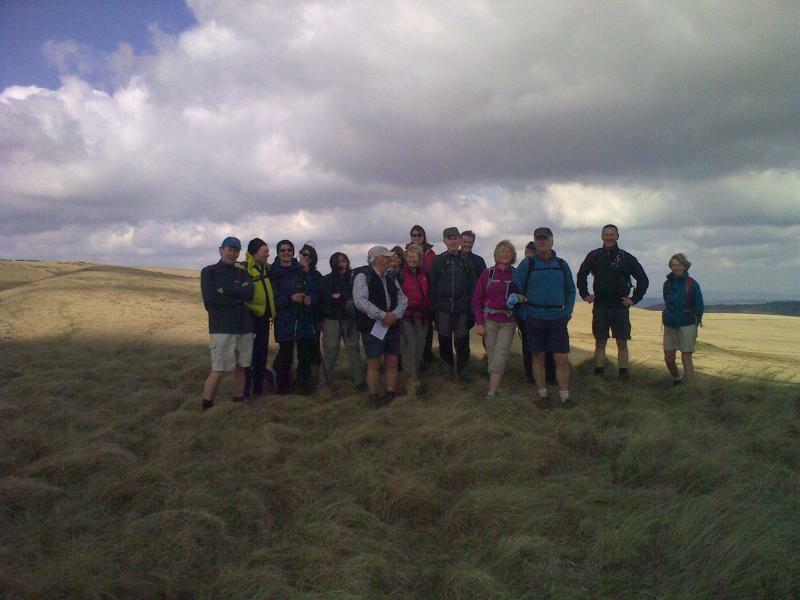 Considering the forecast, and that for once it proved correct, a turnout of fifteen hardy souls was highly pleasing. Thanks to each and every one of them and especially “debutants” Mark Reed and Gordon. Much as we may have felt sorry for ourselves you had to have even more sympathy for all those stall holders, organisers and attendees of the Easter Monday Extravaganza in Avenham Park. All that trouble they had gone to just for the British weather to intervene! 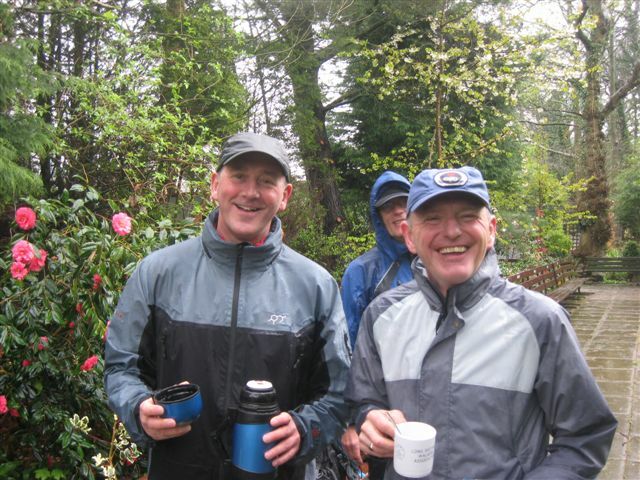 This walk was put on as our contribution to 2012 Preston Guild Year. A recce of the original 1980s Preston Ramblers trail proved unsatisfactory and the eventual route we adopted is based on the new 21 mile Preston Guild Wheel cycling/running/walking track round the city. 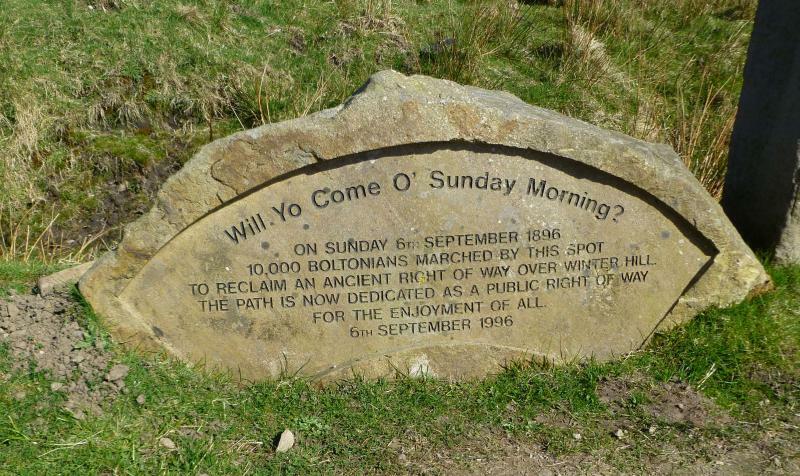 This new trail is to be launched in August and I wish to thank the developers for their help in putting on my walk. 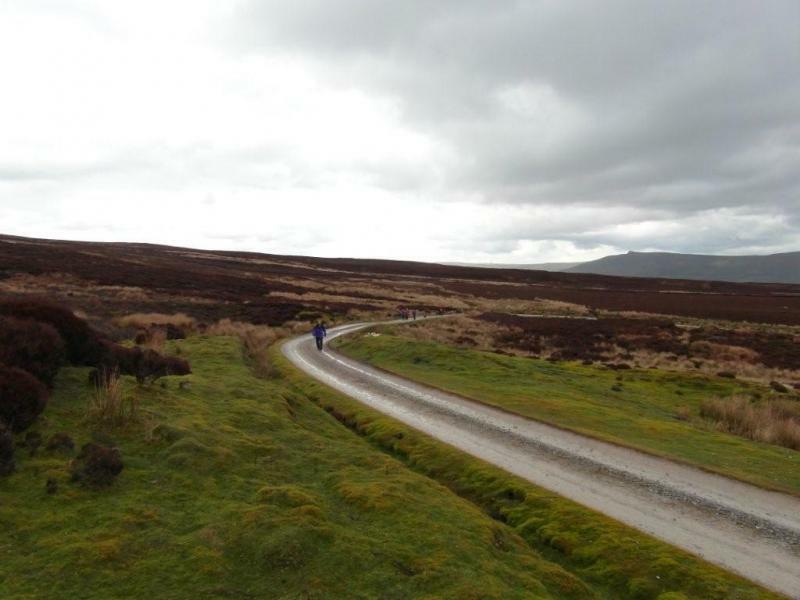 We dipped in and out of the Wheel all day using footpaths alongside where they complimented the trail itself. 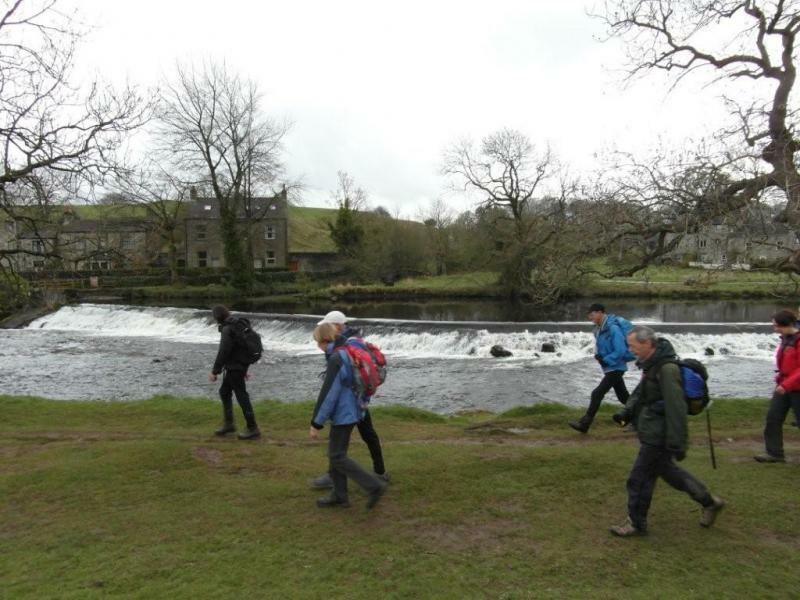 The first quarter of the walk from Walton-le-Dale follows the Ribble Way up to and beyond the new Brockholes Centre. Originally this was to have been the start point for the walk but I baulked at us being asked to pay £10 per vehicle to use the car park (reduced to £7 when I quibbled but still too dear in my opinion). I then planned for it to be a “morning coffee” stop but there is a big sign stating “NO DOGS”! How can they spend all that money on a new nature reserve and then preclude dog walkers? What a nonsense! So by way of protest we didn’t go in at all! We skirted Grimsargh before descending into “Squire Anderton’s Wood”, one of the North West’s most delightful hidden gems and made even more beautiful on Sunday by the bluebells and wild garlic. An early lunch was taken at the fascinating Ladywell Holy Shrine which left us all planning a future sightseeing visit. What a little known, amazing place and the M6 is within earshot! Moving on we crossed the M55 and marvelled at Greyfriar’s Hall before entering Haslam Park, Ashton Park and on to the Riversway Dockland. 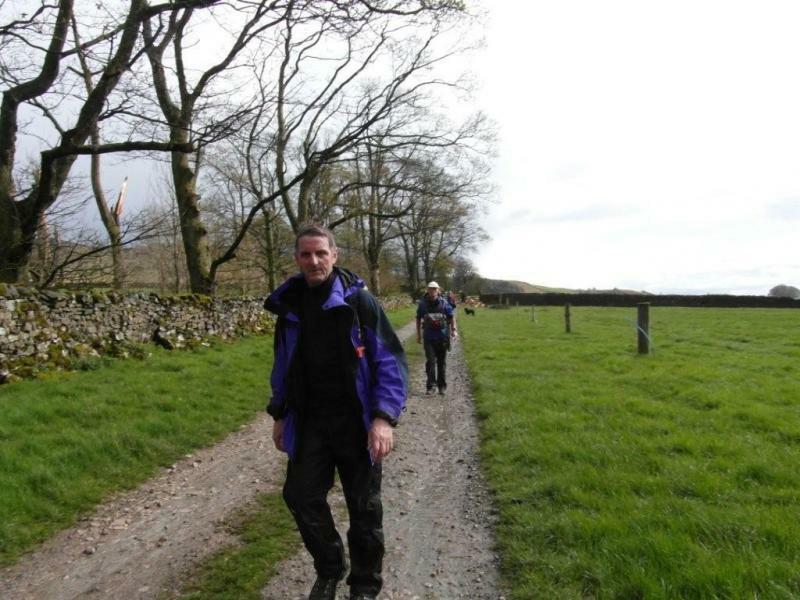 I had told people we were going to do something which had never before been done on an East Lancs walk, it drags the club into the 21st Century and may well see me asked to depart in disgrace. No one guessed correctly! A scheduled pre-planned afternoon stop at McDonald’s! In my defence I knew by this stage liquid refreshment would be needed and the plan was to get teas or coffees and drink them “on the hoof”. But I never expected Andy Dobney to sit down with Big Mac, Super Size Me Fries and triple chocolate McFlurry! All that remained was to circle round the marina and follow the River Ribble back to the start. It being Easter Weekend the steam train was in operation and, as I mentioned, we just had to feel sorry for the washed out Easter Egg Rolling competition in Avenham Park. Thanks to all who came and Ruth, Mary and Paul for helping out. Photos kindly supplied by Andy, Mark and John. A Trot It's Not. Sunday April 22nd. 25 miles from Threshfield. Leader: Jean Lyon. 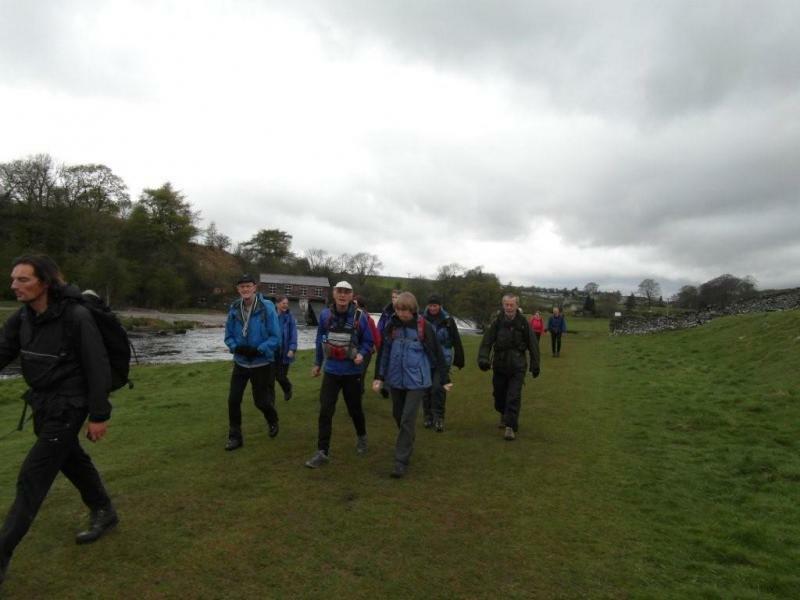 With the weather looking good 15 walkers and 1 dog made their way to and along the River Wharfe. 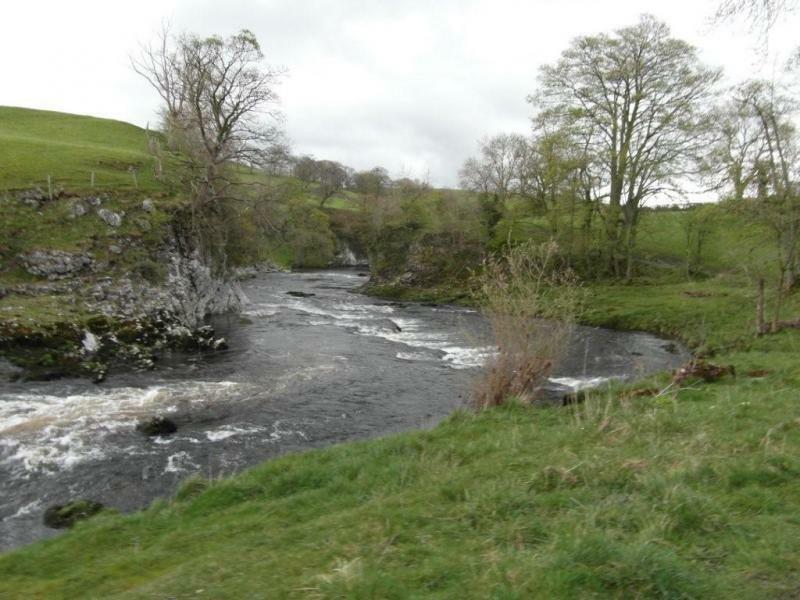 In the company of swooping and diving swallows we crossed Burnsall Bridge and continued to Woodhouse Farm. Trollers Gill. Pleasant coffee stop at the top. and sure enough it caught up with us on the descent. 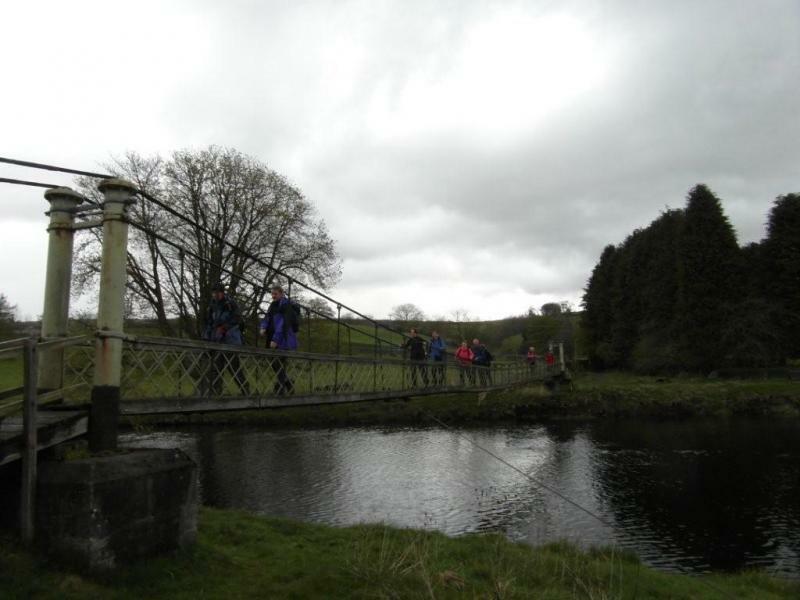 Full waterproofs on, we continued down and along the river towards Barden Bridge; the sun came out - waterproofs off and lunch by the river. But the rain hadn't finished with us and so we scurried off not giving the ice cream man on the bridge a second glance. 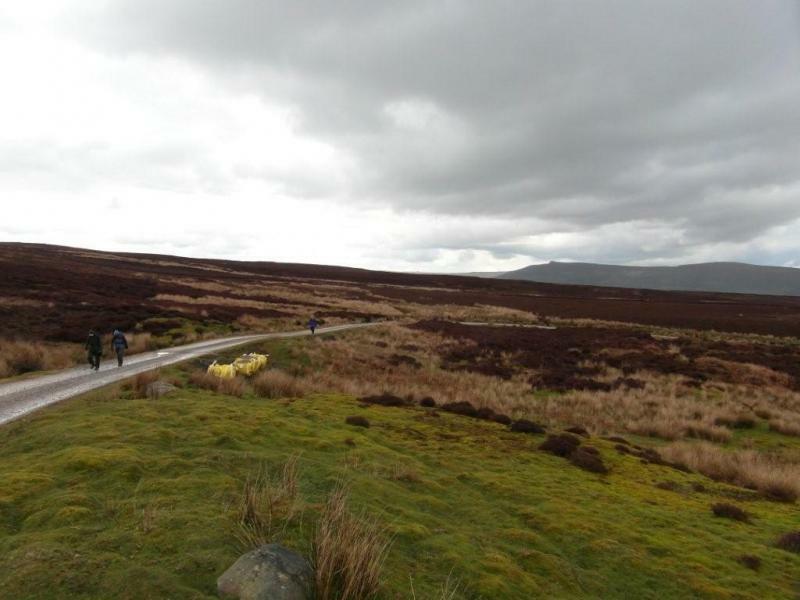 Now the long steady climb up and over Barden Moor. 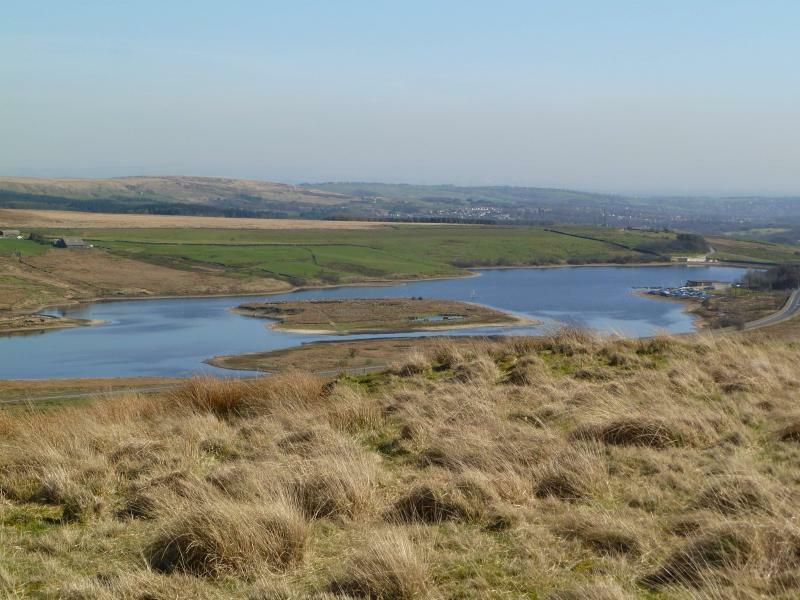 At Upper Barden Reservoir a Warden 'talked' to us about having a dog on the moor. Eventually we reached the ridge near Rylestone Cross and descended to the church. Making our way back across the moor to Threshfield and being battered now by hailstones we came across a 'misplaced' D of E group. 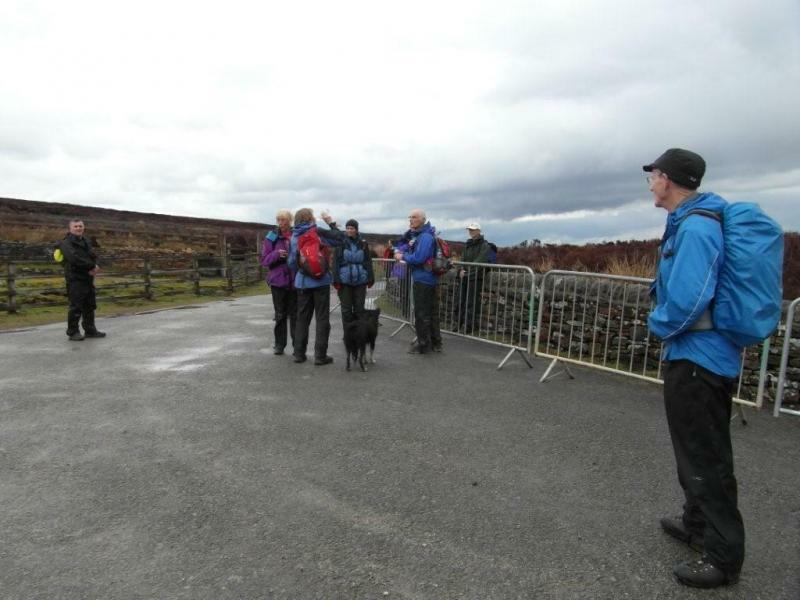 Thank you to all who supported this walk - there were members from Calderdale , West Yorks and Beds Bucks and Northants. A special thank you to new member Linda Webb and we all look forward to seeing you on future walks. HQ Special (Holcombe Quarlton) Wednesday April 25th. 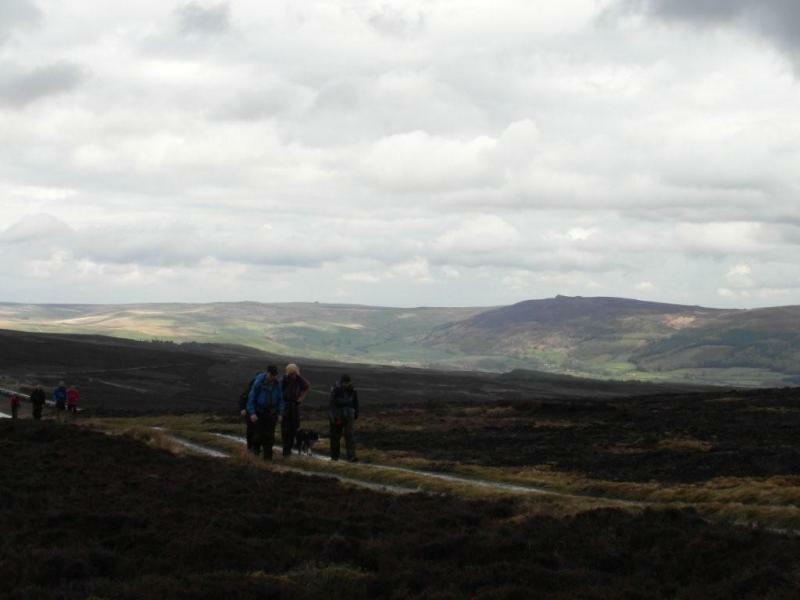 14 miles from Holcombe Brook. Leader: Mike Burton. 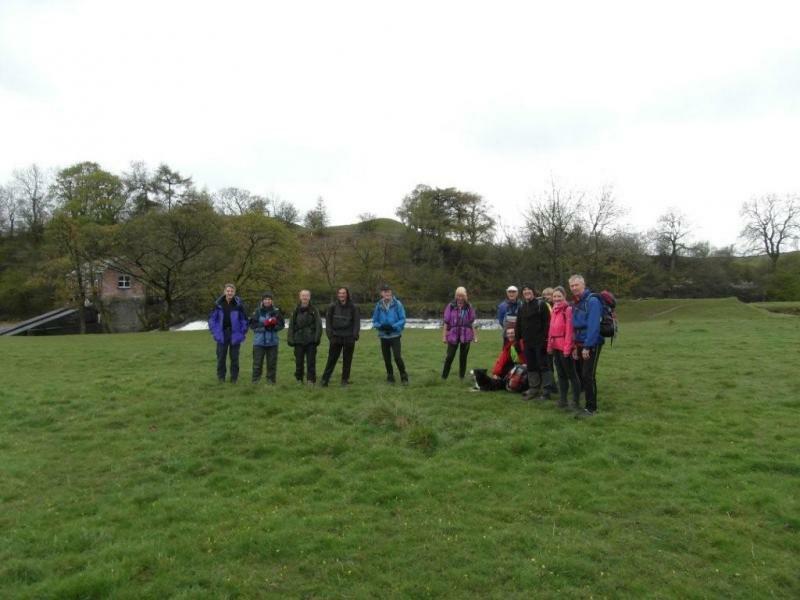 Fourteen walkers and one dog gathered at the Emmanuel Church Centre on a Wednesday morning to tackle the HQ Special, a walk based on the boundary of the Parish of Holcombe and Hawkshaw. It includes a variety of items of interest, often approached from slightly unusual directions. There are remains of mediaeval pilgrims to puritan preachers and Belgian nuns; Roman roads and packhorses to Victorian railway engineering; golfers and cricketers; and lots of other people’s houses and gardens - old and new, large and small. Leaving the Church Centre the route ran down Wood Road Lane into Summerseat, then along the side of Broad Hey Wood and up to Hazelhurst. Taking a field path then through Tagg Wood and on to Dundee Lane and Holcombe. After going down Tanners and on to The Old Mill, there was a steady climb passing two isolated houses, Lower Dickfield and Higher Dickfield. After crossing the road we made our way up to Higher Tops, before climbing Harcles Hill, and on to Pilgrim’s Cross. High winds and driving rain persuaded us to drop down to Moorbottom Road before we made our way to Roger Worthington’s Grave. 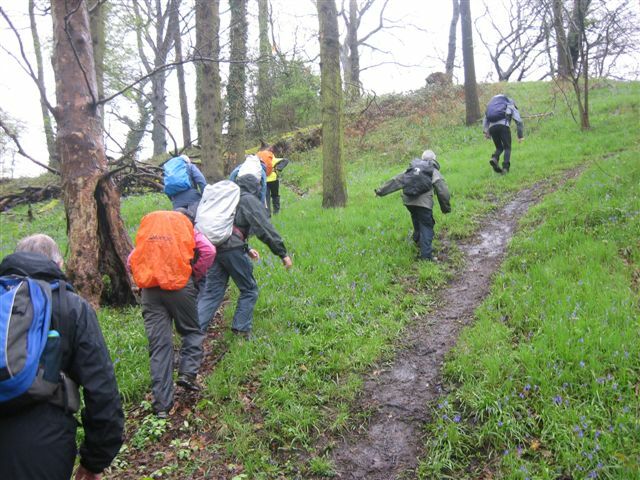 The scheduled lunch stop was curtailed because of the weather conditions before heading on to Boardman’s; we continued by a variety of field paths across towards Higher Barn Farm and Edgworth. After a short road section we made our way once again towards Quarlton Fold Farm, and on to Top of Quarlton, before dropping down to Hawkshaw. Taking the path through Two Brooks Valley to Bottoms Hall and then up to the former Holly Mount Convent, crossed the golf course to reach Greenmount, before passing the Cricket club and making our way back to the Church Centre. Tide in Knots. Sunday April 29th. Despite a formidable weather forecast, 11 intrepid walkers and a dog set off from Arnside Pier, along the Estuary Coastal Path towards Silverdale. So far the weather had remained dull but dry, allowing good extensive views across the estuary to Grange Over Sands. 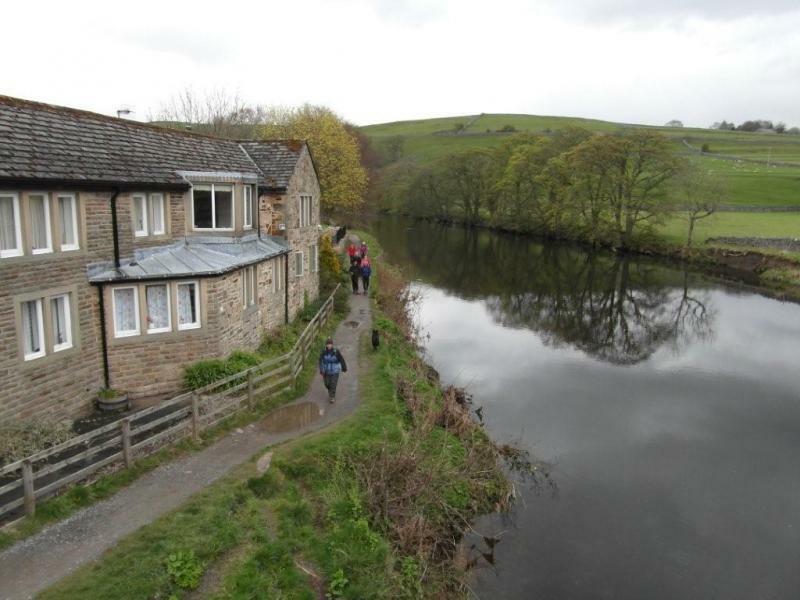 After passing through Holgates Holiday Centre, the route took us through Elmslack and climed up King William's Hill to our brew stop at a delightful stone edifice known as the Pepper Pot. The route then turned south, through Silverdale, across pleasant meadows and woodland, down a steep hill to the more exposed area known as Quaker's Stang. Here the wind picked up noticeably and the temperature dropped, although the predicted rain had not arrived. At Crag Foot we travelled west towards Yealand Conyers, stopping for lunch with an interesting view from higher ground above Leighton Hall. 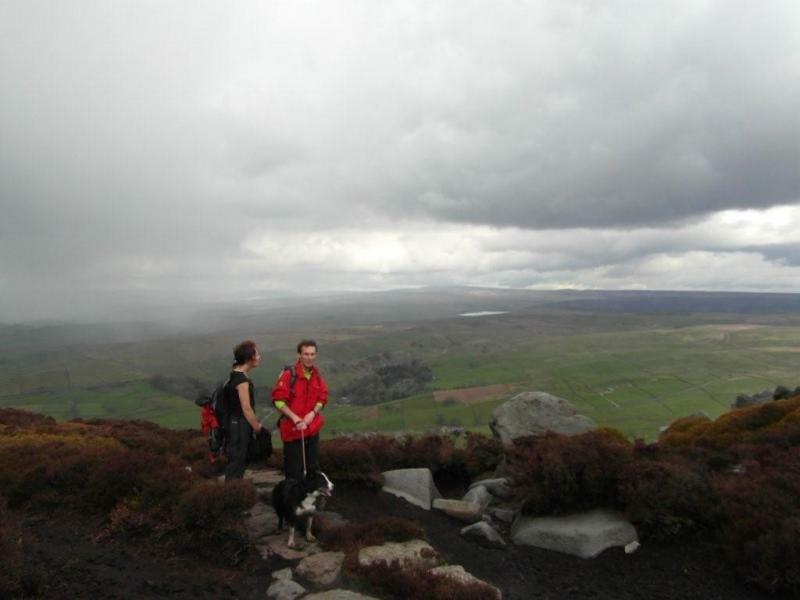 This was where the weather started to deteriorate and out came the waterproofs. Passing Leighton Hall, we crossed Leighton Moss, stopping at a bird hide, crossing a golf course and made our way towards Gait Barrows. Gait Barrows is an ecological wonder, boasting the most important single example of limestone pavement in Britain, covering approximately 120 acres. I think everyone was impressed by the sheer scale and quality of this natural phenomenon. Some wag was heard to say that it must have taken hundreds of lorries to bring all the stone to the site! From Gait Barrows we crossed Back Wood and Black Dyke and walked alongside the railway line to reach Arnside Tower via Middlebarrow Wood. After crossing the Arnside to Silverdale road,we climbed Arnside Knott, which normally from the summit allows a superb vista of the Kent Estuary, but on the day, strong wind and hail contrived to spoil our enjoyment. After descending the Knott we sought refuge in a welcome small tea room near the pier. 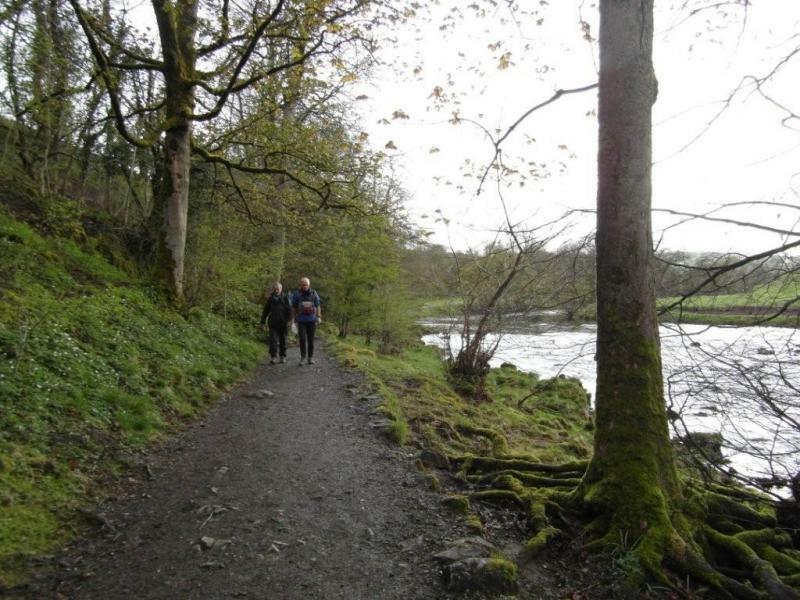 The consensus was that this walk was a fine mix of walking environments and varied views and was well worth repeating.